Mario vs. Donkey Kong: Minis March Again! is the sequel to Nintendo's kinda-sorta take on Lemmings. The positioning of the DSi Menu was changed across regions. 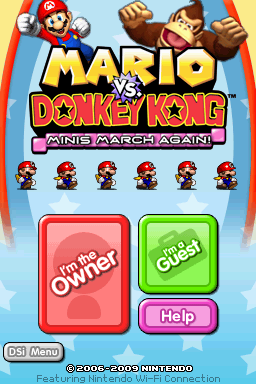 Its text was changed from "DSi Menu" to "Nintendo DSi Menu"
There's a lot of these. There's so much, in fact, they actually start naming them after real cities. These sequences show off slightly different versions of the normal floor intros being used as placeholders for the real plus intros. Since they're the normal tracks, they lack the pause the normal plus versions use for the timer, the defining characteristic of plus mode. SEQ_INTRO_PLUS2 is an earlier version of the Floor 2 intro. It is nearly identical, except that it features a slightly longer ending. Nearly the same deal as SEQ_INTRO_PLUS2, except the difference is at the beginning, and the file name is SEQ_EL_SEGUNDO_CUTSCENE_INTRO. A seemingly unfinished track. A few instruments seem out of place. Another track with a few instruments out of place. An interesting track that uses instruments from Floor 2+! For some reason, it seems to be quite slow, compared to other songs. It sounds similar to a song (Cannon Cove III) from Mario vs. Donkey Kong: Mini-Land Mayhem! The most complete out of all the unused themes. This one even comes with an intro. There are two blank sequences on the ROM: SEQ_RORY_TEST and SEQ_END2B. SEQ_MENU1 was taken straight from Mario vs. Donkey Kong 2: March of the Minis, so the instruments for Magnet Mania (the final uses Pipe Works' stage select theme), Lava Dome, and Spooky Attic are still in the multitrack file, but are never used. SEQ_SPECIAL, SEQ_WIN_SPECIAL, and SEQ_LOSE_SPECIAL are all leftovers from the first game as well. The only difference is that the first sequence's hammer track is now desynced. This page was last modified on 6 February 2019, at 14:48.